When, as tradition has it, Martin Luther (1483–1546) nailed his theses on indulgences to the door of the castle church of Wittenberg in 1517, the hammer blows appeared to usher in a new era for the church. Luther’s act is often considered the beginning of the Reformation. However, a close look at the theses will make it clear that they do not condemn indulgences as such, but only the misuse of them. When it comes to content, Luther’s first act of reform was therefore more medieval than has commonly been assumed. But the form of this important act in the history of the church also must be seen against a medieval background. Nailing theses to a door was not an unusual thing to do, since theological disputations were regularly held on theses that previously had been made known. 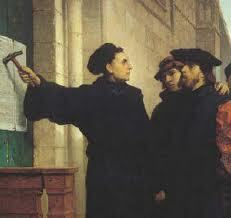 When Luther nailed those famous theses to the door, his intention was to enter into a theological disputation. The disputation genre had developed in the medieval schools and formed an important part of the scholastic method. Luther’s hammer blows may have drawn the curtains on the Middle Ages and heralded a new era in church history, but as such his first act of reformation was entirely medieval. Added to this paradox is the fact that Luther engaged in disputes against scholastic theology only shortly before nailing the ninety-five to the door. In his attack on scholastic theology, Luther thus used an element from scholastic method, the disputation. This was because Luther understood the concept of scholasticism in terms of content, as representing the teaching of Aristotle and William of Ockham. Luther’s Galatians commentary (1519), whose contents identify it as a Reformed commentary, was similarly the fruit of a medieval pedagogical method, the lectio (reading), in which a (biblical) book was read and commented on by the master during his lectures. –Pieter L. Rouwiendal, “The Method of the Schools: Medieval Scholasticism.” in Introduction to Reformed Scholasticism. Willem J. Van Asselt. Ed. (Kindle Locations 1140-1152). Reformation Heritage Books. Far from being a great anti-scholastic revolt, Luther’s initial reformatory foray was scholastic, both in content and in method. It was somewhat of an unintentional revolution initiated by professor thoroughly shaped and formed from within a tradition, not the work of an outsider rebel disrupting the system from without. At the expense of moralizing an interesting historical tidbit, there might be a bit of cautioning, or at least chastening, word for would-be theological revolutionaries. Luther, Calvin, and the other great Reformers were all, for the most part, trained and schooled in the classic texts, sources, methods, and theology, which is what allowed them to be so devastatingly effective, both in retaining the best of the catholic tradition, as well as criticizing its excesses. There is likely more value in learning and submitting to the tradition, doing the hard work of study and so forth, than hot-blooded young types looking to reshape the Church want to do. Thanks for the review and your comments. Van Asselt’s book is wonderful. I have been following your blog for a short time, and have thoroughly enjoyed it.